Importance of Superb Wholesale Fabrics Highlighted by Paris Fashion Week Couture Trends, Notes Fabric Selection Inc. Commenting on a recent article, a Los Angeles based fabric company notes that the monochromatic trends during Paris fashion week emphasizes the evergreen value of a wide selection of high-end fabrics. Fashion designers heavily rely on high quality fabrics for their garments. 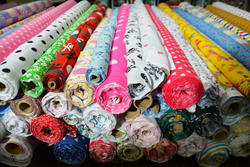 Fabric options - Any creative design project requires a lot more than just good planning. Creating beautiful pieces requires top-quality and long-lasting materials. Fabric Selection Inc. notes that their warehouse is filled with a variety of unique and durable fabrics for any designing need. From micro suede to velvet and everything in between, Fabric Selection Inc. houses a large variety of high quality fabrics year round. In-house designers - Offering one-of-a-kind fabric choices to designer customers is also an extremely valuable service, notes Fabric Selection Inc. The Los Angeles wholesale fabric company adds that the fabric offered by Fabric Selection Inc. is personally designed by its highly experienced and extremely creative team of in-house designers and the company holds all the copyrights to those designs. The company says that this means that, customers can rest assured knowing that the top quality fabric designs don’t infringe on products made by their competitors. Order Online - Oftentimes, customers find it hard to stop their busy design work in order to make a trip to a fabric store. It not only interrupts the design process for the client, but it can also be one task too many during a particularly hectic day. Fabric Selection Inc. notes that they offer their clients the opportunity to shop at their own convenience through their website. Clients still get the same stellar customer service treatment online as they would if they visited the warehouse, and they can even browse through the fabric company’s hundreds of fabrics at their own pace and comfort.